Glowing Christmas toys would help you to make and maintain a holiday atmosphere at your house. Today we can see a lot of various Christmas decorations in stores. 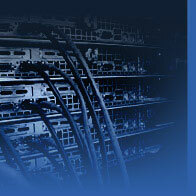 However we don't want to bring you so-called new but still similar to other products. We create something special and unique, a product that you have never seen before. So what makes Noxton Christmas tinsels and toys different from ordinary ones? The difference is in a self-glow feature of our products, in other words, we create the beautiful Christmas decorations that glow in the dark by themselves. Glow effect will not just bring its own flavor to your house but will also make your holiday safe. It is known that when we want to make our holiday fascinating and colorful we usually use Christmas garlands which often become the reason of fires and other troubles at our houses. When using our glowing Christmas toys (we can offer our customers a wide range of products - from self-glowing Christmas balls, animals, stars and snowflakes to luminous Santa Claus statuettes and figurines) you can be sure they want cause a fire in your house. In fact the idea of self-glow effect is in its independence from extra sources of light. Christmas tree toy, covered with a glow powder TAT33, accumulates the light from any source (daylight, filament lamps and others) and starts to emit the light when the charging source stops to glow. In other words, right after the lights are off, toys on a Christmas tree start to glow by themselves. And you won't need any appliances to get the effect – no extra sources are needed, so there is one more reason to buy our luminous Christmas toys. In case you love to make a holiday at your home all by yourself and every year you create unique handmade decorations then you would definitely be interested in cooperation with our company. In fact you can make glowing Christmas tree toys and Christmas crafts absolutely by yourself. In order to do this just order Noxton's luminous paint for souvenirs and use it to bring a new glow feature to your decorations. We prodive our customers with all the necessary information on how to use the luminescent paint. Consultations are also available. So it has never been simpler to make a fabulous and unforgettable holiday at your home. Christmas tree is an invariable element of the holiday night for all of us. Noxton Company always stood for saving the green spaces and protection of the environment. That's why we can offer you our self-glow Christmas trees. Christmas tree from Noxton is definitely better than the ordinary artificial ones because due to its glow in the dark effect you won't need any extra illumination like garlands or lanterns for your Christmas tree. If you want to make your holiday even more fascinating – hang some self-glowing decorations on a Christmas tree, decorate it with luminous balls and snowflakes, and be sure your Christmas tree will be beyond comparison. 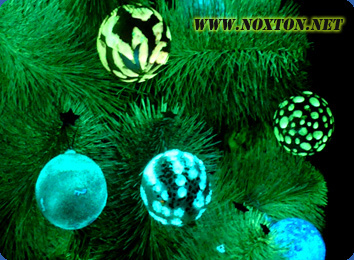 Make sure you checked out other products from Noxton that will go perfectly together with our Christmas decorations: glowing Christmas tree, self-glowing souvenirs, luminous glasses, luminescent stones. We can either cover a toy all with a glow powder or draw a pattern on it. Of course the pattern complexity and the amount of work affects the price of the end-product, but what can be more beautiful than handmade luminous Christmas tree toys made by your own design. It is a good tradition we have today on Christmas to wish a happy holiday and give small presents to each other. What actually can be more awesome than a Christmas toy with a unique glow feature? By giving such a present you will not just pay attention to your loved ones but will also surprise them by showing your attitude towards them because everyone knows it is not that easy to find such a unique present that you won't be able to buy in local supermarket or store. It takes some time to make a glow in the dark toy, especially if it is being made according to your own pattern (design details can be discussed beforehand). So you'd better think in advance about what presents you are going to give to your family and friends. Ingredients: Luminescent powder is applied to the surface of Christmas decorations. They may be all covered with powder or we can make a tracery. Purpose of luminescent Christmas toys: Used for interior and Christmas tree decoration. May also be a present. Properties of self-glow Christmas tree toys: Tree decorations will glow in the dark with no extra sources of light. The brightest phase lasts 30-60 minutes in the dark, but if you will be charging the toy using more efficient source of light for a little bit longer (like to make an "extra charge"), glow in the dark will depend on how long you were "extra charging" the toy, while the maximum possible glow time is 8 hours considering the extinction. Recommendations: Turning off the room lights always results in glowing of the treated Christmas decorations. Glow colors: Light green, yellow, light blue, red, orange and others. Ecology: Product material is non-toxic, non-radioactive and non-hypoallergenic (so you can use our luminous toys even if you there are small kids around, and not worry about their health and safety). Storage and use of luminescent Christmas decorations: No time limit. Glowing material has quite a long lifetime, so afterglow effect will be seen for more than 200 years. That's why it is more about the safety of the decorations themselves - self glow feature will be there as long as you use them. Tree decorations from Noxton have an unlimited lifetime. Light green and light blue glow for the tree balls are the strongest ones. The most popular ones as well. Glow intensity is so high that right after you turn off the light the Christmas tree balls start to literally illuminate the tree and surroundings. It won't take you more than 2 minutes to charge the light accumulative tree decorations. Noxton Technologies, as a producer of unique Christmas decorations, informs its customers that you can even make a small luminescent Christmas toys factory at your own home! We would be happy to provide you all the necessary information on how to make appealing and unique holiday gifts. Start your own business with Noxton Company, the leader in the field of luminous products. To see the prices for Christmas tree toys from Noxton please proceed to "Price list" page.